It was a trip of a lifetime for local resident Gerry Duguid and guest speaker at the Cornwall Township Historical Society October meeting. While serving in the Canadian Army in 1966 Gerry was chosen from a select few to represent the province of New Brunswick on a team of six voyageurs who would paddle their way across Canada in a canoe. The trek began in May 1967 at Rocky Mountain House Alberta and ended in September at Montreal at the site of Expo 67. Gerry described his exploits on this journey of of lifetime facing everything from hoards of black flies to carrying the canoe in portages over rugged Canadian Shield wilderness. Gerry says that he now meets regularly with his former voyageur pals and on occasion have had an audience with various Governors General. In the photo are Left Gerry Duguid, Ken McDonald and Art Buckland. Avid local historian and now published author, Carol Goddard recently released her book entitled The Morewood War Memorial. The book is geared for children but the message appeals to all ages: how war memorials remind us of the great sacrifices made by others who fought and died for our freedom. In particular, the book focuses on the Morewood Memorial constructed and funded by residents in the hamlet of Morewood in 1921. Besides being well scripted, the book is beautifully illustrated by artist Carrie A. Keller. A portion of all book sales goes to the Morewood Cenotaph Committee for future care and maintenance. Her presentation was held at our September 2018 meeting. At our March 2017 meeting Brenda Baxter from Glengarry Fencibles Trust updated us on the progress of the preservation and restoration of the historic Bishop's House located at St Raphaels. The Bishop's House was once the home of Bishop Alexander Macdonell whose work in the early 19th century raised the Glengarry Fencibles for the War of 1812 which defended Canada and Great Britain. He was the first bishop of Upper Canada and he acted tirelessly to help large numbers of ordinary people of all faiths in their dealings with government. Members of CTHS feels that the efforts of the Fencibles Trust is a worthy cause as it will send a message that we need to preserve the past if history is to live on. It was agreed almost unanimously that we contribute $2,000 which will be matched dollar for dollar by a Parks Canada grant. In the photo presenting the cheque to Brenda Baxter are Left to Right Don McIntosh, Ken McDonald, Brenda Baxter and Johanne Cameron. 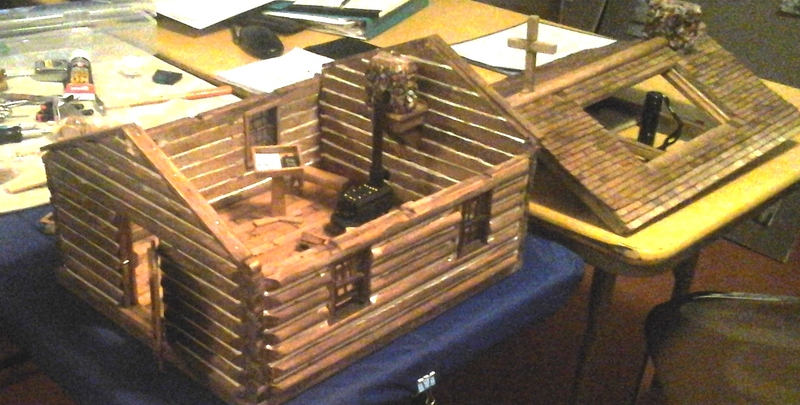 Local craftsman Brian Sturgeon attended our April meeting to display the recent completion of the miniature log church he built. The church is an exact replica down to the last detail of the log church located at the pioneer cemetery in St. Andrews. Brian says that he spent over 500 hours this past winter building the model. Brian also showed us some of the small tools he used during the construction. At the opening meeting of 2013 in March, local author and historian Thom Racine paid a visit to CTHS. Thom described the background behind his writing the book Constable Davey: A Future Lost and the efforts involved in the research. Thom discovered that many of Constable Davey's descendants had moved to the US, making the genealogy trail a bit challenging. CTHS purchased a hard cover copy of the book which is available for borrowing by all members. In the photo, Don McIntosh presents Thom with a copy of our Historical Memories book. In November Jessie Boyd, aka Art Buckland, made an appearance at the Historical Society's monthly meeting to promote her new book, Still Kicking But Not So High. At 96 years of age Jessie recently published her memoirs and recounts her life as a widowed mother, business woman and the difficulties she faced. Feeling somewhat under the weather for the meeting, friend and confidant Art Buckland agreed to stand in for Jessie. In the photo, president Bill Costello shares a laugh with "Jessie". Readers may order Jessie's book through our web site. Go to the BOOKS FOR SALE page of this web site. 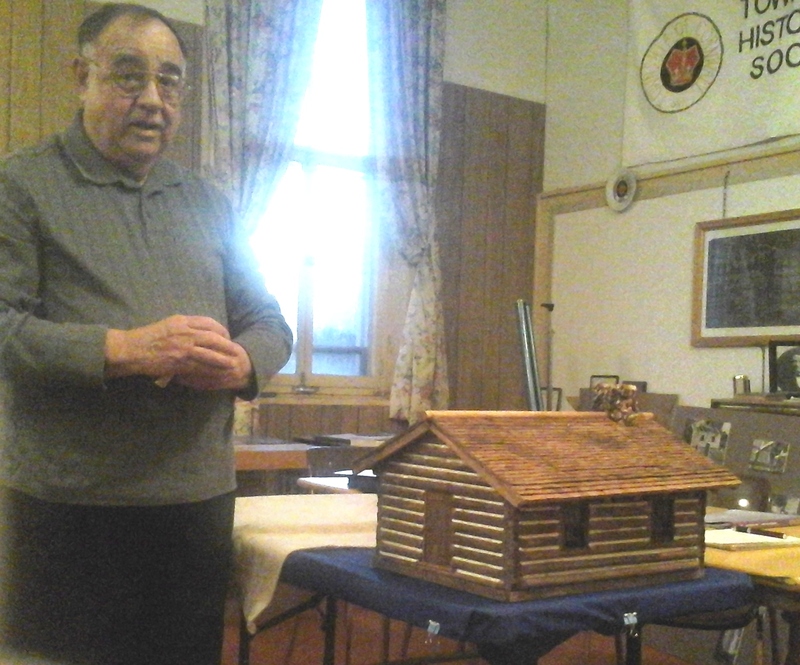 At the May 24th meeting of the Historical Society, invited guest speaker John Filliol spoke to members about the Larose Forest in Prescott Russell Township. Following an idea from agrologist Ferdinand Larose in the early 1920s, the Larose Forest was born in an effort to mitigate the effects of soil erosion caused by abandoned lands. Over 18 million trees have been planted on 10,540 hectares of territory between the villages of Bourget, Casselman and Limoges. The Larose Forest has become a jewel of biodiversity in the heart of an area that is essentially agricultural. John explained that people have come from as far away as Japan and France to observe some of the unique spices of trees that were planted in the forest. Don McIntosh (L) presents John Filliol with a Historical Memories book. At the Pot Luck luncheon on December 4, long time member Dale Duncan was presented with a painting by Libby Cameron. The occasion was Dale giving up her long time residence on the Black River Road and making a move to an apartment in Cornwall. Dale promises to remain active in CTHS and that only her address has changed. Her enthusiasm for local history remains . Members in attendance wished Dale well in her new home and an invitation by Dale was extended for all to drop by and visit her. But just not everyone all at the same time. At the May 2010 meeting, guest speaker Sheena McKenna talked to CTHS members about the Gaelic language and how it influenced local culture. Immigrants arrived from Scotland in the early 1800s with few processions; only their culture, music and language. From the Highlands of Scotland, most immigrants settled in P.E.I., Glengarry County or Cape Breton Nova Scotia. Once in Canada, Sheena explained how the Scots faced almost insurmountable odds clearing land and setting-up farms. It was the culture and music that sustained them in those difficult years. Sheena discussed the decline in the use of the language and the reasons for the decline. She says, however, that the echoes of the Gaelic language can still be heard throughout Glengarry County. There is a resurgence in the interest of the language. Currently, Gaelic is taught in 16 schools in the province of Nova Scotia. Sheena finished her presentation with a Gaelic song that is dedicated to those who preserve tradition and history. At the April 27 meeting of the CTHS, our guest speaker was Michele Allinotte. Michele is a lawyer and a resident of the area. Michele points out that estate planning is not just for the sake of the individual, it protects your family and your loved ones too. Michele says that we should review our wills periodically and that estate planning is not a one size fits all solution. As an added service to her clients, Michele will often record a conversation with her clients as a legacy to pass on to loved ones. "We all have stories to tell," she says. What a great idea to be able to share those stories with future generations. In the photo, president Ken McDonald thanks Michele for her presentation to CTHS members. At the March 23 meeting of the CTHS, guest speaker Leon Chamois talked to members about The Military Heritage Museum located at the Cornwall Armories. Mr. Chamois is the volunteer curator of the museum where displays and artifacts of S.D.&G. 's proud military past can be viewed. He makes it clear that the museum doesn't celebrate war; rather, it commemorates the proud history of our military men and women who fought valiantly for the freedom that we all enjoy today. The museum is dedicated to currently serving S.D.&G. Highlanders, former Highlanders and their families. As such, it is a Regimental Museum unlike the Canadian War Museum in Ottawa. The museum is open by appointment only. For guided tours, Mr. Chamois can be reached at 613-936-9124. In the photo, Don McIntosh (L) presents Leon Chamois with a copy of Historical Memories. Cornwall Cheese Maker Eugene Kyer demonstrates the Process of Making Cheddar. What normally takes 8 1/2 hours was completed in just 20 minutes as Eugene Kyer put on a cheese making demonstration for members of CTHS at the October 27 meeting. With his props and equipment Eugene, Upper Canada Village's cheese maker, explained the whole process starting with un-homogenized milk and ending with a 90 pound cheese round. Eugene explained the ingredients that go into making cheddar and why temperatures are a big factor in determining the type of cheese produced. After the meeting, members sampled some of Eugene's two year aged cheddar. The reviews were excellent. take a temperature reading from cheese vat. At the September 22 meeting, special guest speaker Frank Quinn spoke to members of the Historical Society about the St. Lawrence Seaway Authority. Frank recently retired from the Seaway. He presented a well researched background on the project and how the political and technical issues were overcome. It is still unclear whether the Seaway project has long lasting benefits for Eastern Ontario. The project silenced the Longue Sault Rapids which were one of the greatest natural wonders in Canada. Frank is seen here receiving a book from Maureen McAlear. On May 26, local maple syrup producer Gary Ivens gave members the sweet facts on the process of creating maple syrup. Gary and his wife Jean produce over 400 gallons per year on their 400 acre farm, Maple Ridge, near Apple Hill. Their maple syrup operation is the first in the world to receive the Approved Forest Certification, a much coveted world renown forest certification. Maple Ridge produces syrup with ultra modern equipment and sells mostly for the wholesale market, shipping products world wide. The farm has been producing maple products since 1850; this generation since 1969. Gary provided all the members in attendance with bottles of his syrup. Here receiving his sample from Gary (R) is Don McIntosh (L). On April 28, former Ag Rep for Stormont County Dale Miller explained how agriculture offices started as an experiment in 1906, spreading across the province. Stormont County established its first Ag Office in 1944. It was during his tenure as Ag Rep in 1994 that Dale and his committee of area farmers came up with the idea of recording the changes that have been made in farming over the past 50 years. That led to the publishing in 1996 of the "Evolution of Farming in Stormont County". Dale explains that one of the features of the book is that it has lots of pictures.. something that Marland Murray insisted on. On Tuesday March 24, members of the CTHS heard from someone who has a keen interest in the War of 1812. Carol Goddard gave her perspective on the causes of the war as well as some of the pivotal battles that happened right in our area. As a member of the St. Lawrence War of 1812 Bicentennial Alliance, Carol gave members a sneak preview of some of the activities that are planned for the 2012 bicentennial celebrations. Carol assured members that the history of the war will be dealt with in a respectful and appropriate manner. Anyone who has an interest in assisting with the upcoming celebrations can get more information at www.celebrate1812.ca . On Thursday November 13, the Ontario Heritage Trust Foundation unveiled a plaque and raised the Ontario flag in St. Andrews’ historic Pioneer Cemetery. The occasion was one that Jim Brownell MPP worked long and hard to bring to fruition. “This area is rich in culture and heritage. It saddens me every time I drive by the cemetery in St. Andrews that there is no marker honoring Ontario’s first premier buried here.” Jim’s life long goal is finally achieved. In 2007, under a Premier’s Directive, Dalton McGuinty appointed the Ontario Heritage Trust to mark and commemorate this site, as well as all resting places of deceased Ontario premiers. Jim paid tribute to the CTHS and in particular Maureen McAlear for her encouragement and the passion she has for this historic cemetery. South Stormont Mayor Brian McGillis reminds people of the rich history that we have here in the former Cornwall Township. He is also pleased to announce that Council recently passed a motion to name the park at St. Andrews in honour of explorer Simon Fraser, another historic figure buried in the cemetery. At the conclusion of the official ceremonies, CTHS hosted a reception in the St. Andrews Parish Hall.